The cutting edge of the tool is perpendicular to the direction of feed motion. The cutting edge of the tool is inclined to the direction of feed motion. Chip flow is expected to in a direction perpendicular to the cutting edge. The chip flow angle is more than zero. There are only two components of force; these components are mutually perpendicular. There are three mutually perpendicular forces acting while cutting process. The cutting edge is larger than cutting width. The cutting edge may or may not be larger than cutting width. Chips are in the form of a spiral coil. Chip flow is in a sideways direction. High heat concentration at cutting region. 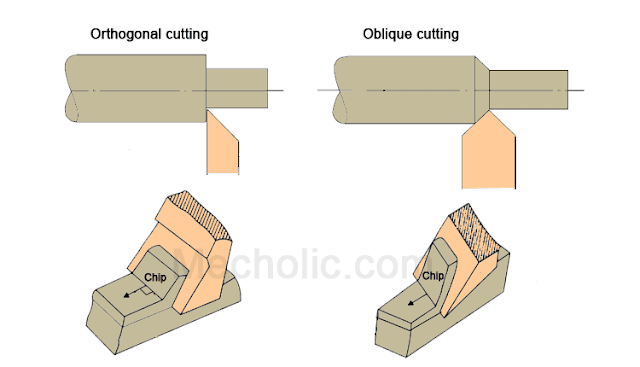 Less concentration of heat at cutting region compared to orthogonal cutting. For a given feed and depth of cutting, the force acts on a small area as compared with oblique cutting, so tool life is less. Force is acting on a large area, results in more tool life. Used in grooving, parting, slotting, pipe cutting. Used almost all industrial cutting, used in drilling, grinding, milling.